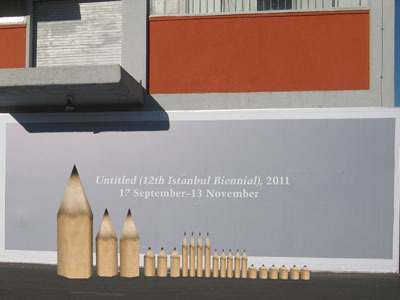 This work series is located in and around the buildings of the Istanbul Biennial. 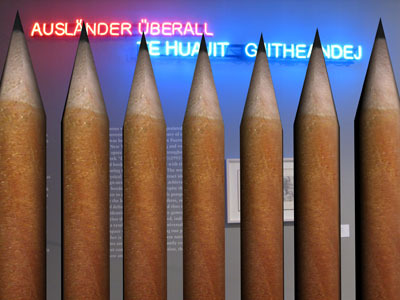 Inspired by Pedrosa and Hoffmann's curatorial statement referencing the works and methodology of Felix Gonzalez-Torres, these artworks overlay simple everyday objects and forms onto real spaces to "explore the relationship between art and politics" in the new medium of Augmented Reality (AR), which by its very nature is "both formally innovative and politically outspoken." 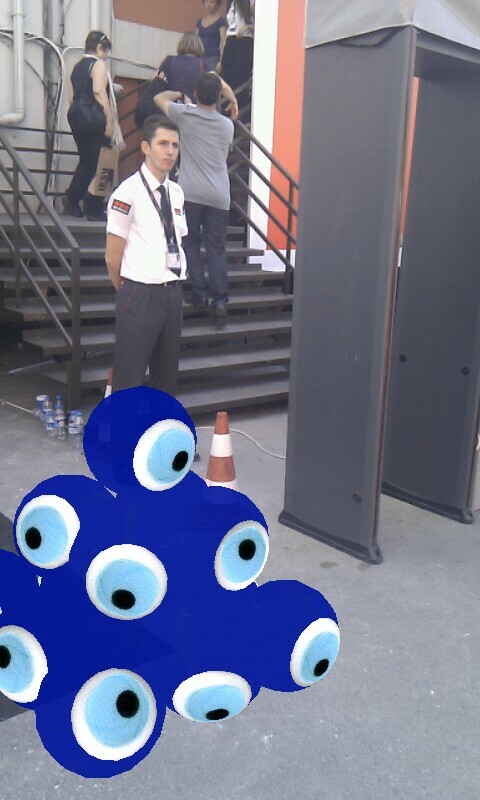 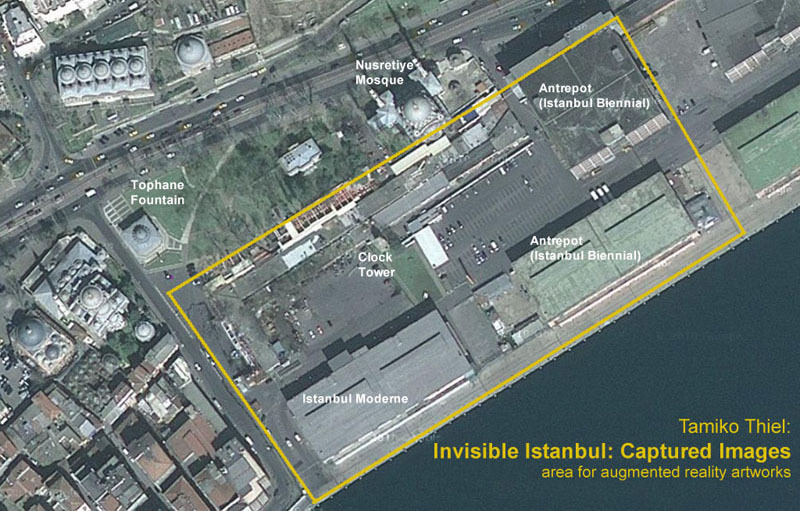 The AR artworks are geolocated via GPS into the exhibits of the 12th Istanbul Biennial to "push the themes decidedly further" and relate them to contemporary political and social issues. 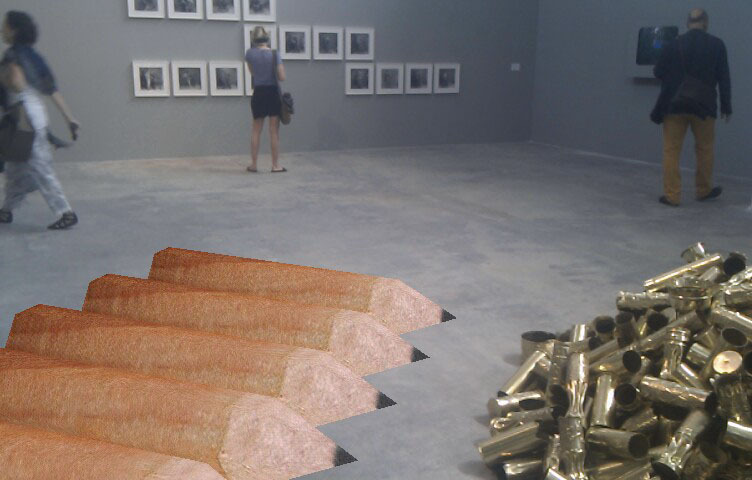 To cite Pedrosa and Hoffmann, "In response to those today who devalue the exhibition as the primary format of artistic and curatorial expression," the AR artworks "advocate for renewed attention to the importance of the exhibition itself." 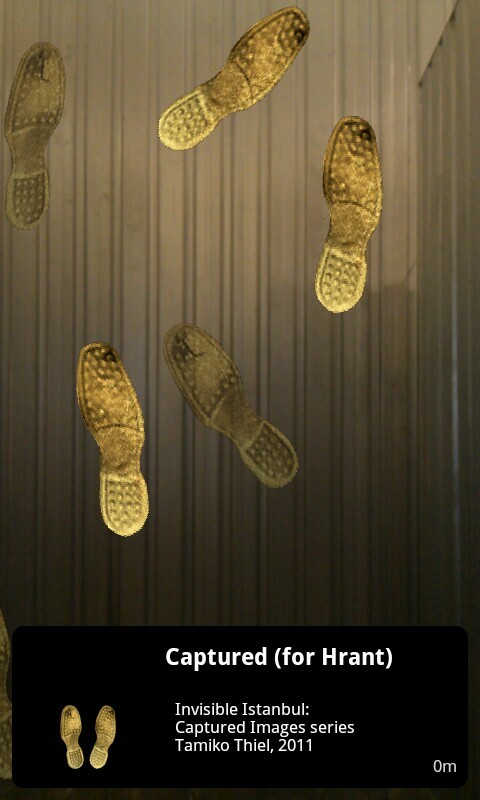 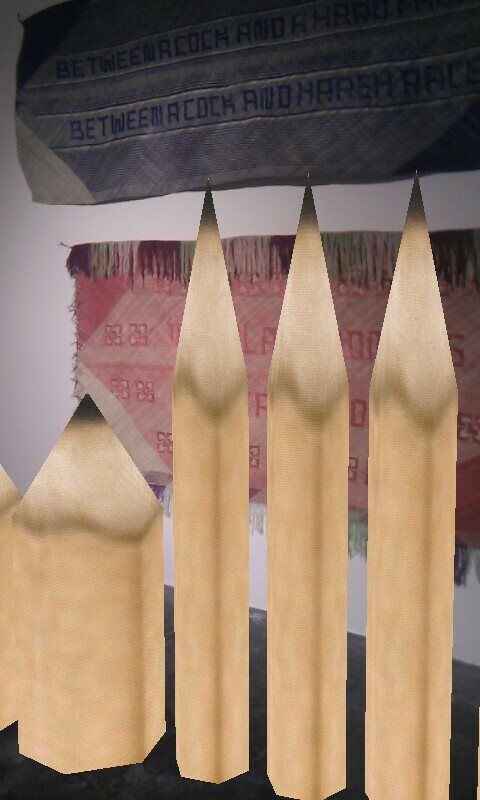 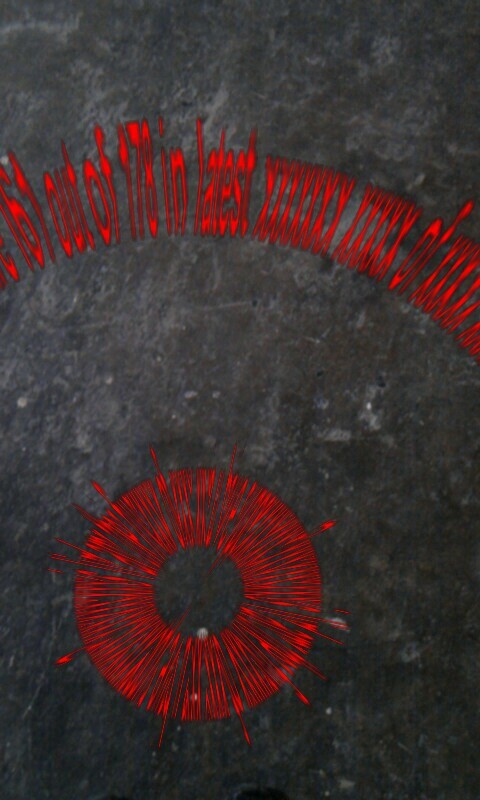 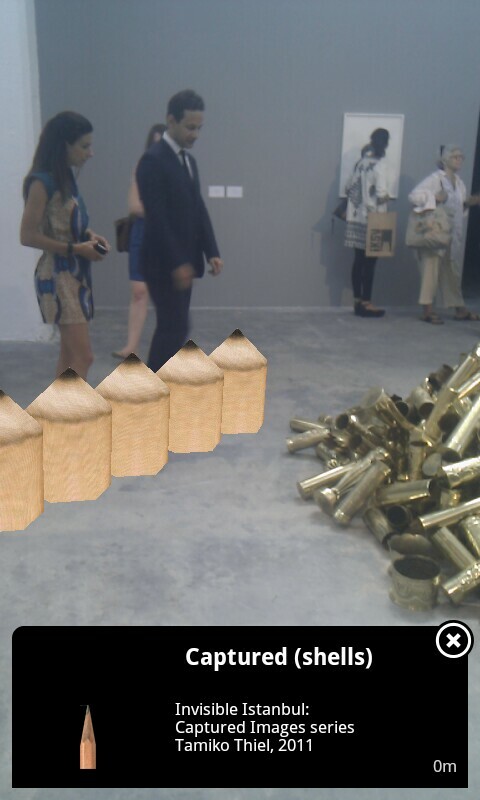 The difference is that with AR technology, participation is the decision of the artist, not the curator. 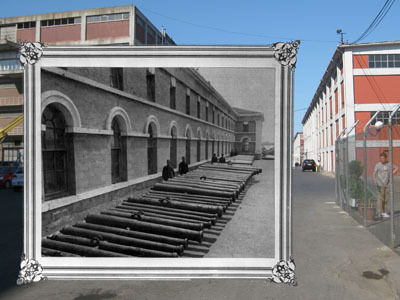 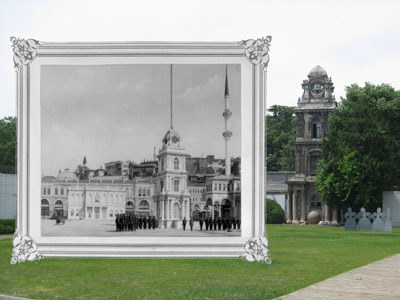 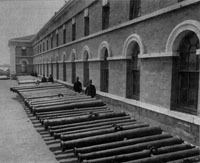 The 2011 Istanbul Biennial is sited in the Tophane area of Istanbul, where the imperial munitions factory and barracks stood in former times. 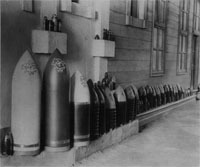 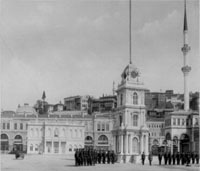 The AR artworks in "Invisible Istanbul: Captured Images" reference displays of munitions and troops documented in photographs taken for the last Ottoman Sultan Abdul Hamid II. 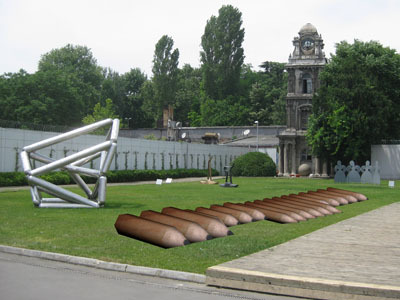 Today, the only remaining structure from former times is the Clock Tower on the lawn of the Istanbul Modern, and this area is used for displays of art, foremost the Istanbul Modern Art Museum and Antrepot 3 and 5 (Sanat Limani), where the Istanbul Biennial is being held in 2011.
next to Kris Martin's "Obussen II"
In the exhibit "Untitled (Passport)" the artwork "Captured (stockade)" encircles the viewer completely. 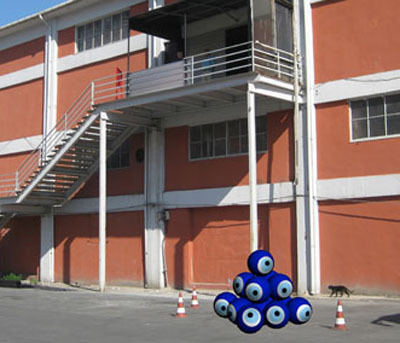 When the "nazar boncugu" glass amulet breaks, it has averted the Evil Eye. 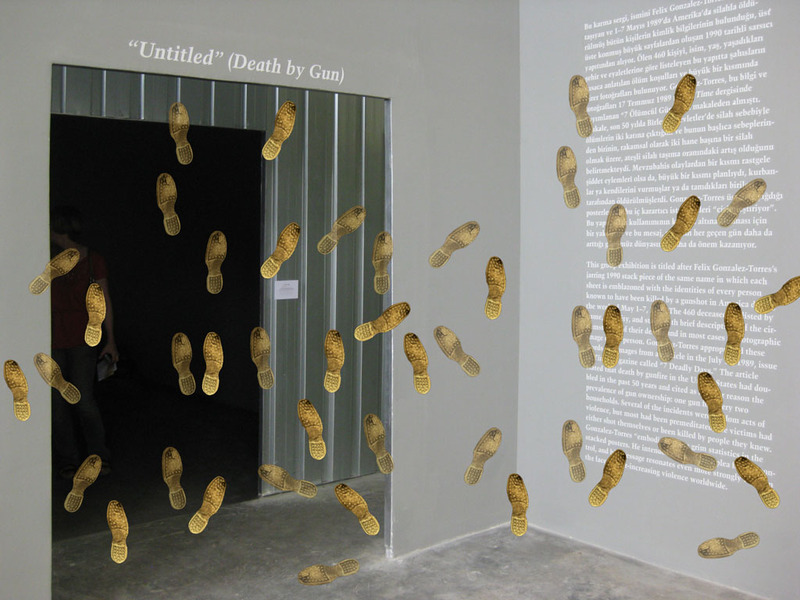 In the exhibit "Untitled (Passport)"
"Captured for Abdul Hamid II)"
Tamiko Thiel is a media artist developing the dramatic and poetic capabilities of various forms of virtual and augmented reality as a medium for exploring social and cultural issues in site-specific artworks. 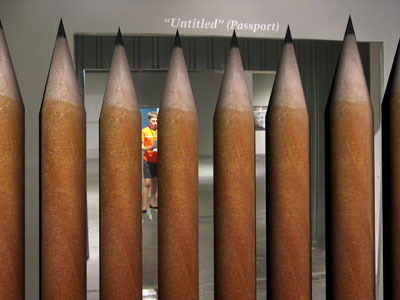 She has degrees in engineering from Stanford and MIT and a fine arts degree from the Academy of Fine Arts in Munich. 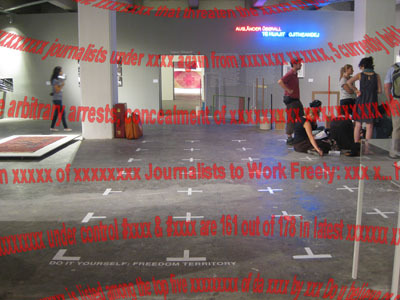 She exhibits internationally in venues such as the International Center for Photography in New York, the Institute of Contemporary Art in Boston, the ZKM in Karlsruhe and the Tokyo Metropolitan Museum of Photography, and at festivals such as Siggraph, ISEA and Ars Electronica. 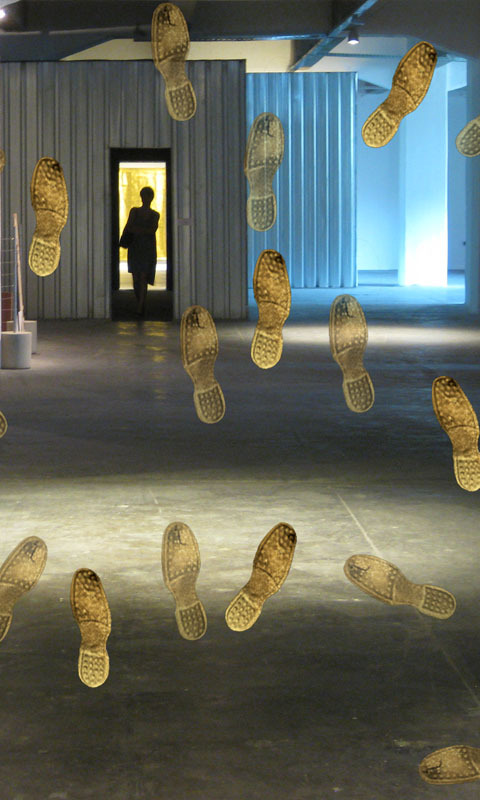 Her work has been supported by grants from WIRED Magazine, the Japan Foundation, the MIT Center for Advanced Visual Studies, Berlin Capital City Cultural Fund (Hauptstadtkulturfonds) and the IBM Innovation Award. 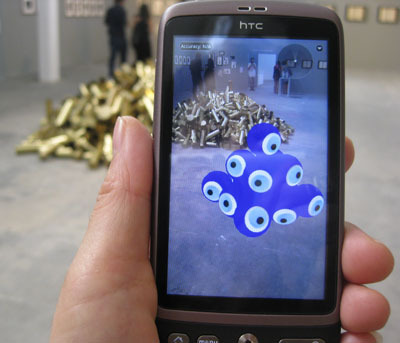 As a founding member of the augmented reality artist group Manifest.AR she participated in the pathbreaking uninvited augmented reality intervention at MoMA NY in 2010, and led the AR intervention at the Venice Biennial in 2011.